A few years ago I was introduced to The Sims 3. My then-fiancee and I were living with another couple and the male half of the couple bought the game. He recreated their living situation with characters based on all of us. I was familiar with The Sims (I wasn’t living under a rock!) but I had never seen or played it before. I thought it was fascinating. Later that year for my birthday our roommates bought me a copy of the game and the World Adventures expansion. I wound up accumulating a half dozen expansions for the game. I started really getting into programming and I stopped playing it because when I was on my computer I knew I should be coding and not playing games. I eventually deleted it off my machine because I needed the space. A few months ago my husband got bored and started playing with it. The way that he played the game was completely different than the way I played it. When I played the game I would create a bunch of different games and characters so that I could do different professions and hobbies. Any expansion that included a new hobby or another set of professions was one I had to obtain. I really like the Supernatural one and I wanted to get the University one before I put my life on hold for programming. After he went through every expansion I had, bought every business he could, and bought the biggest house he could buy, he stopped playing. I doubt he will ever pick it up again. I thought his playing behavior was insane. Why on Earth would you play The Sims to go out and buy every business in the town? The money isn’t real. It isn’t a microcosm of what it would be like to actually own a business in the real world. Why bother with doing that when there are so many options to explore? A) Diamonds/Achievers: These people are Diamonds because their objective is to accumulate riches. This can be game currency, reaching the top of the leader board, etc… All other parts of the game, like socialization and expanding the world exist only to find new sources of treasure. B) Explorers/Spades: These people are Spades because they like to dig around in the environment to see what is there. Explorers don’t care about wealth accumulation, socialization, or killing unless doing those opens up options for the player to explore. C) Socializers/Hearts: These people are Hearts because the act of human interaction is the draw for them. The game is just the medium that these people use to find other people to interact with. They will help others further their goals if it allows them an opportunity to socialize with that player. D) Killers/Clubs: These people are called Clubs because they enjoy clubbing people. These would be the stereotypical First Person Shooters players whose only enjoyment in the game is imposing themselves on others and killing other players. So these guys are the sociopaths of the gaming world. Most people don’t fall solely into one of these categories. They usually are strongly one and have a secondary trait of another. I found it interesting that this theory explains the different ways my husband and I would play The Sims. The Sims appeals primarily to Spades and Hearts, but there was a component in there to appeal to Diamonds as well. 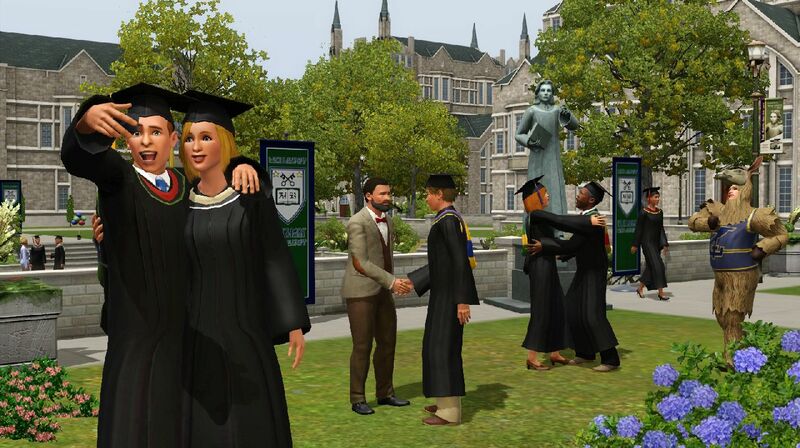 The Sims is a very well-designed game that accommodates a lot of different player types. I think that many times if you are designing a game you are creating something that appeals to your player type only without thinking about adding components that would appeal to the other types. This was a revelation to me about how many different types of people can all play the same game and how my husband’s way of playing the game, while not the way that I would have played, was not wrong.